Legos were not around when I was a child, so I don't have any personal childhood memories of Legos. However, my son (who now has a son of his own) was an enthusiastic Lego collector and builder. Unfortunately, when my son was small, I don't think there were any LEGO train sets available. Even so, birthdays and holidays almost invariably resulted in new Lego sets to play with. I spent hours playing with him, helping him build the sets by the instructions until he got beyond needing that help. We built the sets, then disassembled them and let our imaginations run wild with space ships, moon colonies, airplanes, cars, buildings--anything we could think of, we tried to build with Legos. So, even though I do not have memories of Legos from my childhood, I have many wonderful memories from my son's childhood. Now, my grandson loves Legos. I love to watch his imagination to soar, so that I can see what wonderful things he will build. I think this year, holidays and birthdays will begin a long and lasting relationship with one of the world's most educational toys. The The Lone Ranger Constitution Train Chase may be in his future. It looks like fun, and if he needs help with it, I am sure his dad will be happy to play with Legos again! It is possible that I will be able to keep his dad away long enough to help my grandson build it, but I will probably be watching while they build it. Future memories for three generations. I can't wait! WARNING: LEGOs trains may contain (a) small magnet(s). Swallowed magnets can stick together across intestines causing serious infections and death. Seek medical attention if magnet(s) are swallowed or inhaled. Lego kits contain small parts. The LEGO Make & Create Holiday Train Set measures over 45" long and includes a locomotive, tender, passenger car with removable roof, 7 minifigures (including 2 engineers, 1 railroad worker and 4 passengers), and loads of special elements for a total of 965 pieces. When motorized with a Lego Speed Regulator 4548 and a Lego My Own Train 10153 9V Train Motor, this train becomes a memorable part of future holidays--a family tradition. The speed regulator and tracks are sold separately. Lego consistently provides hours of fun and adventure with their building sets. The LEGO train sets , like this LEGO Creator Emerald Night Train (10194), are not only fun to build, but can be motorized to run on a track. According to one reviewer, the engine Emerald Night most closely approximates is a British Pacific Class A3. 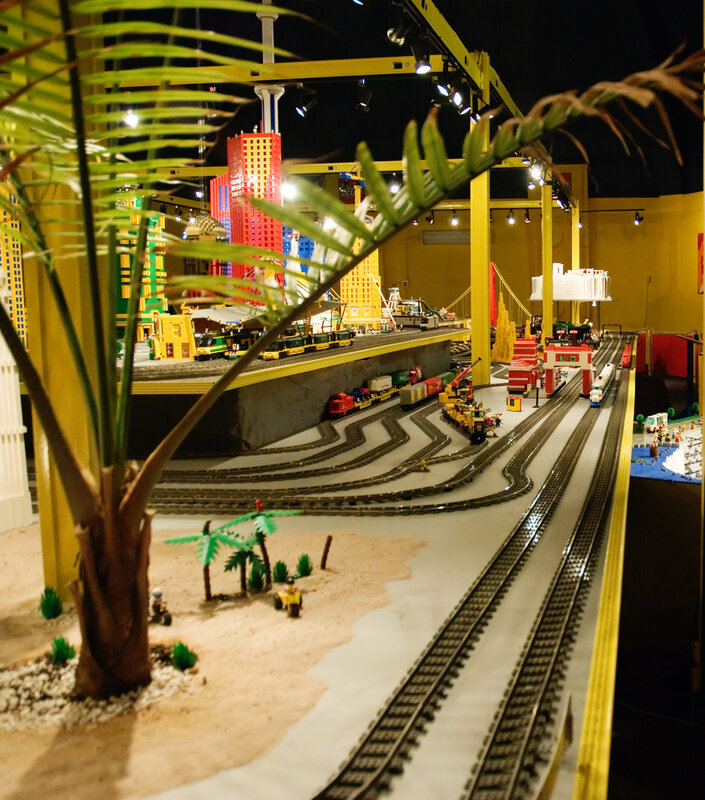 Whether you are into model trains or just enjoy Legos, these kits are just plain fun. These kits do come with tiny pieces that are not recommended for children under three due to choking hazards. That said, these trains are a wonderful addition to a train table, a bedroom shelf, or even setting on an office desk. Just make sure you aren't playing with it when the boss walks by! Lego has a wide assortment of train kits, from the Emerald Night Train (10194), to the Harry Potter Hogwart's Express (4841) set, to the Monster Fighters The Ghost Train (9467) set. There is a set for almost anyone to enjoy! they run around a track!